Warren Buffett may be feeling rotten after investing in a British grocery chain that's gone bad. His famed investment company, Berkshire Hathaway (BRKA), is the third biggest Tesco (TSCDY) shareholder, with a stake of almost 4%. Tesco is the U.K.'s leading supermarket operator. Berkshire is now nursing losses of about $750 million on the investment after the shares plunged by as much as 43% this year. It paid $1.7 billion for the stake. Tesco issued a series of profit warnings this year as its sales shrank in the face of intense competition from lower cost rivals. Its top management, including the CEO and finance chief, have been replaced. The biggest shock came earlier this week when Tesco was forced to admit it had overstated profit forecasts for the first half by £250 million ($409 million). It suspended four executives and called in auditors from Deloitte to conduct an investigation. 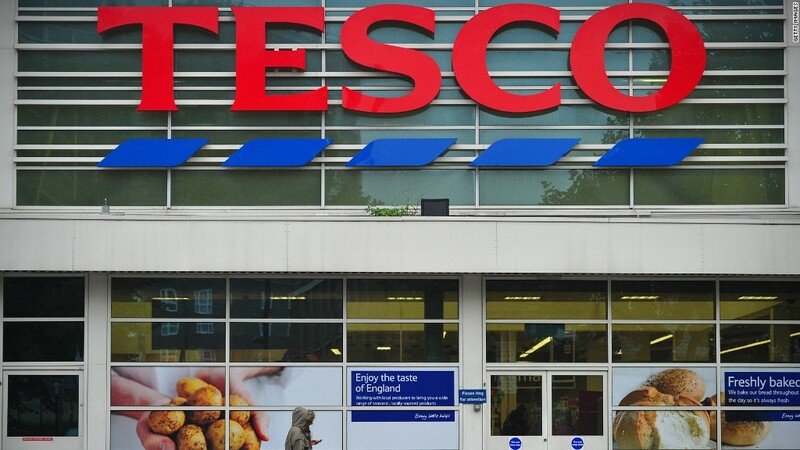 "Considering all the problems that Tesco is tackling at the moment ... poor internal accounting issues was the last thing it needed," said Alastair McCaig, a market analyst at IG in London. "A downgrade of 23% for its profit forecast is more than a minor issue." Since the company reported the accounting bungle Monday, its shares have dropped by about 17% to an 11-year low, wiping roughly $5 billion off the firm's market value. Buffett is unlikely to be panicking yet. His guiding principle has always been to find solid companies that will do well over the long-term -- for years, not just a few quarters. This "buy and hold" mentality has helped Berkshire prosper for more than four decades. Berkshire Hathaway also owns a significant stake in Tesco competitor, Wal-Mart (WMT), as well as American Express (AXP), Coca-Cola (KO) and IBM (IBM), among others. Berkshire did not respond to a request for comment. Tesco's top two shareholders are Norges Bank and BlackRock (BLK).